GasGas was origionally a small trials , enduro and motocross shop tucked away in the back roads of the town of Salt near Girona. The business started in the late 70's and was a dealership selling Bultaco and Swm motorcycles and repairing all sorts at the same time. it was just like your typical small friendly dealership. It was situated on a small residential road of terraced houses and there was flat above the shop lived in by the landlord Dani i Font i Maten.. 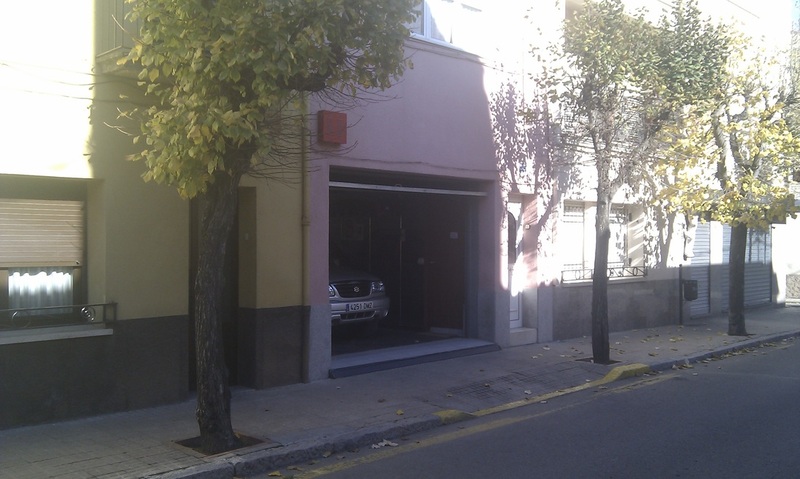 This was a shop run by Spanish Enduro Champions Narcis Casas and Josep Pibernat. 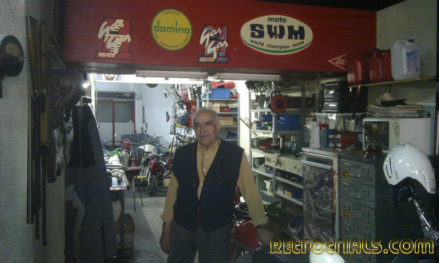 Dani helped the young men Narcis and Josep with motorcycle repairs in the shop. In the early 1980's Bultaco and then SWM closed leaving the dealership with no bikes to sell. To see a full report on this first Workshop , click hereSeeing a hole in the market and being in an area full of redundant skilled labour and affluent with motorcycle parts manufacturers , the two males designed and built their first motorcycle , the GasGas Halley 1985. This was named after the Halley comet that appeared in the skies the same year. 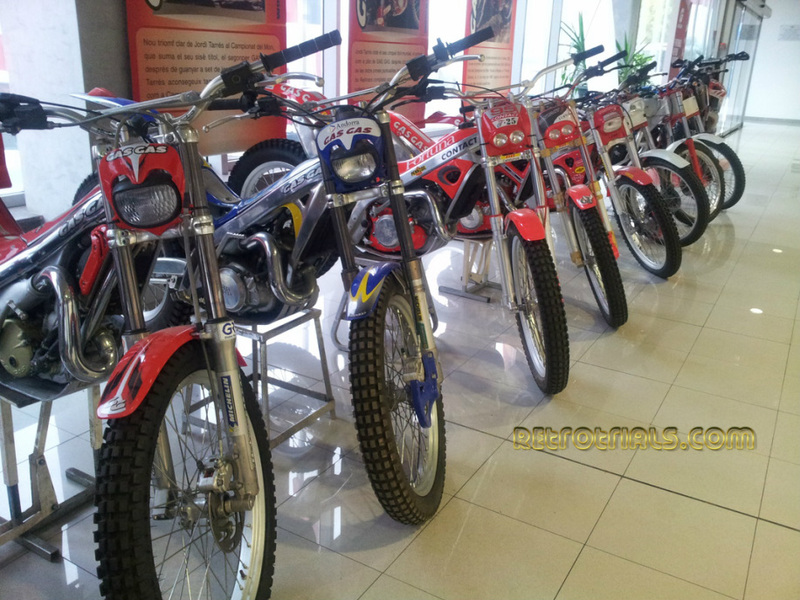 By 1988 GasGas had become a company getting a good foothold in the trials World. 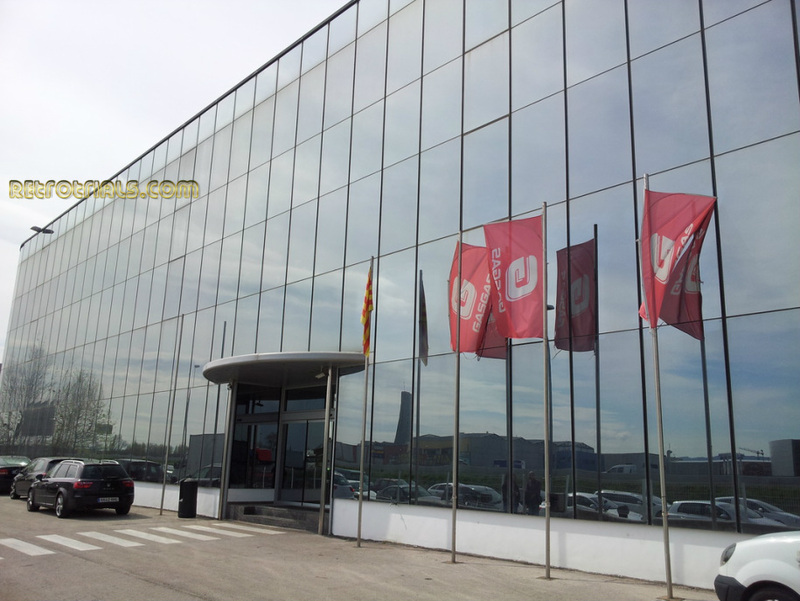 They expanded in 1988 by moving into the old Merlin factory in Fornells de la Selva in Girona , essentially swallowing Merlin , but ceasing their production. For a tour of the old GasGas Merlin factory click here. 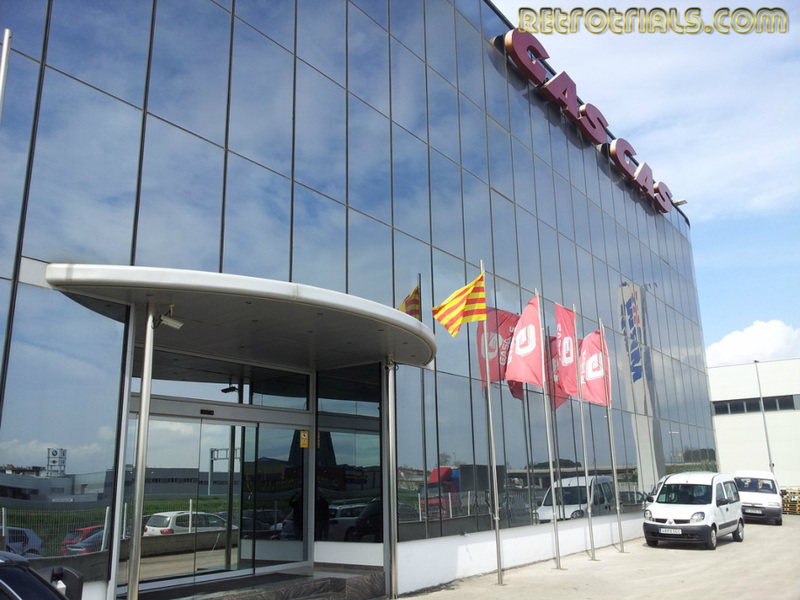 In late 2003 GasGas on the back of its continued success the company expanded into its own purpose built factory in Girona. In 2013 i was granted access to the current GasGas factory. This isnt easily achieved .They are a company that dont easily open their doors. Ask yourself the question. How many tours or photos have you seen of the GasGas factory? GasGas value secrecy and keeping the public informed in a controlled and well produced manner. When you look around a working factory , you are peeling off the skin and looking deeper. Its very often something that manufacturers simply dont like. I suppose then larger you get , the more you have to protect and value. Honda are a typical example of this. They value their secrecy to a great degree. They do not want anyone to see what they are working on , let alone photo it. They are no 1 because they do everything better.Research and Development costs millions but can be stolen in seconds. Little production tips can be picked up here and there from photos by competitors who then will try and improve these or undermine these ideas. As a result of this my photos of the factory were heavily .....and i MEAN heavily censored. I was not allowed just to take photos. The public relations manager was a charming , friendly and professional 25 year old. He would be my guide. He personally directed me on every individual photo i took. The angle , what it showed , what was in the back ground , who and what was in it. I had to ask again and again for the photos that i obtained. If he had had his way , i wouldn't have been allowed any. I don't blame GasGas at all for this. It makes perfect sense from their point of view. My point of view that there are thousands of GasGas enthusiasts around the World and many , many of them would love a look behind the scenes. He understood this ....however i guess the companies need to control information has to be greater than people having a photo tour !? You cannot just roll up at the front door and explain that you have a GasGas trials bike back home and would be really interested in a look around. It simply wouldn't work , you would be left sitting in reception for a very very long time. My interest in GasGas developed many years ago and from the Amos Bilboa days. GasGas at this time were little known out of Spain and commentators on Trials videos would refer to them as if they were unusual and a little strange. 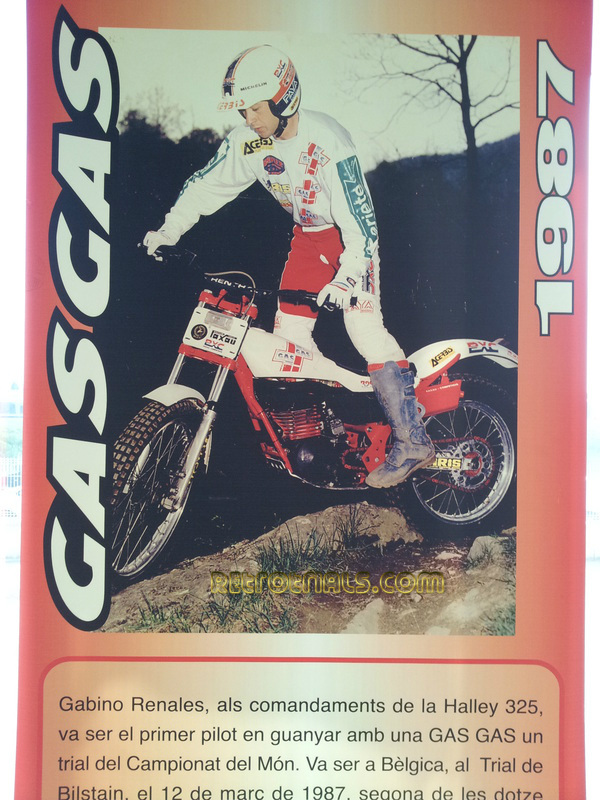 In fact , this was right at this time .Back in those 1991 days GasGas had had plenty of success in its home market . It had also exported a fair few air cooled models around the World , but the company has huge plans. 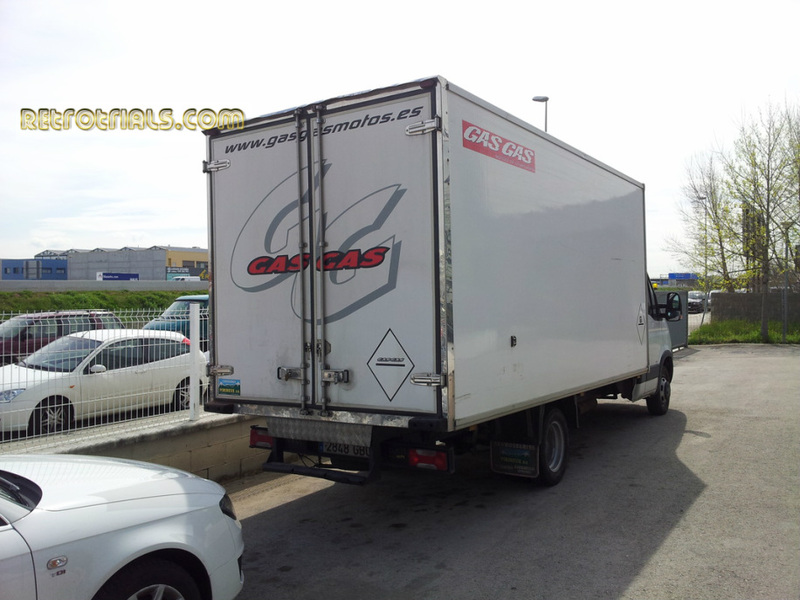 These plans have led GasGas to the current day where they are Spains largest motorcycle manufacturer. I recorded my time at GasGas and everything that was said , so that i could recall it better now and give you more and better information. It was all done with the consent of my friendly guide. The first thing my guide explained to me was the new Factory GasGas trial would be unveiled in one weeks time but unfortunately i could not see or photograph this. 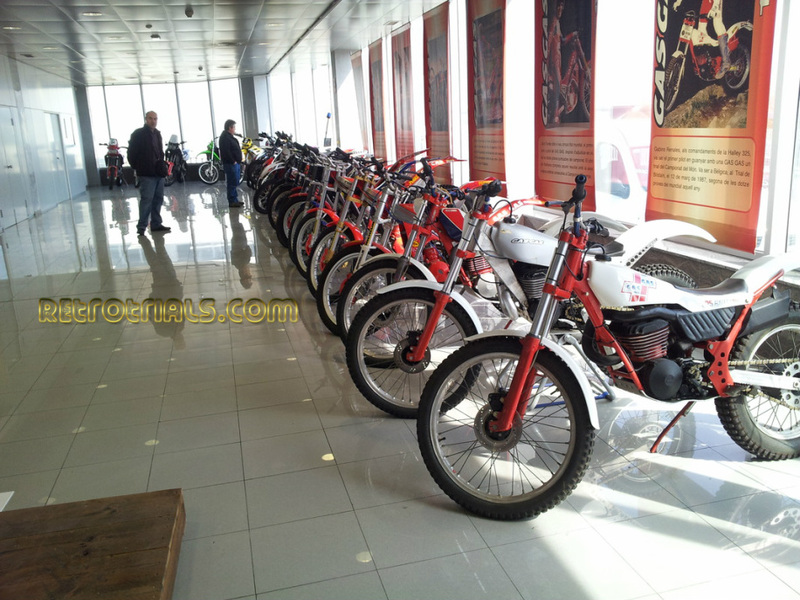 I was then shown the GasGas museum in the front reception and given an explanation of each individual bike which was very interesting. A moment later we were issued passes and headed though the infamous double doors to the left of the reception desk. From visits here before I knew that this led directly into the factory. I had heard the increase in noise as the doors opened and shut. I was desperate to get though them. As we approached the door my guide told me that photos were forbidden in this area. From here onwards i spent most of my time on my knees begging for photos, reasoning , explaining with my guide looking over my shoulder. My trousers now have holes in the knees , but you have some photos , so it was worth it :). My aim of the visit was to get a good tour and lots of photos. My aim differed greatly from GasGas' who didn't want me to take photos. As a result many conversations surrounded , me asking for a photo and him saying "No". My reasoning and coming to an agreement .My guide mentioned to me that production techniques might be revealed. Bikes awaiting certain parts might be seen. Data protection was never far away from the conversation.